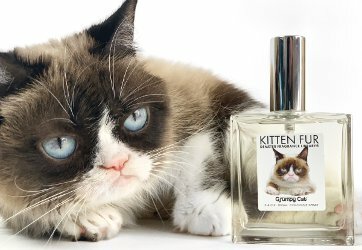 A collector bottle for Grumpy Cat fans: Demeter Kitten Fur in limited edition packaging featuring Tardar Sauce. 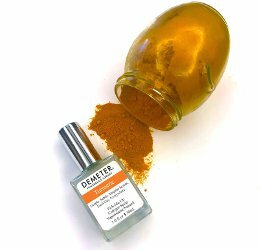 Per Demeter, this is "the first cross species limited edition celebrity collaboration". In 30 ($23) or 100 ($40) ml Cologne Spray or in a 10 ml Roll On Perfume Oil ($12). 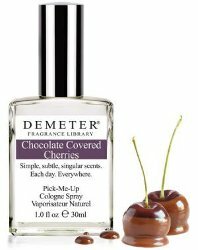 The perfect lemming for Chocolate-Covered Cherry Day: the Demeter version. "It was the French, however, who had the brilliance to mix the cherry with Kirsch, a colorless liqueur that originated in Germany, made from distilled juice of black cherries and crushed cherry stones, and cover the entire ensemble in chocolate. Voila! the Griotte, or chocolate covered cherry, was born." You can get a 15 ml purse spray for about $11, or the splash version for half that.